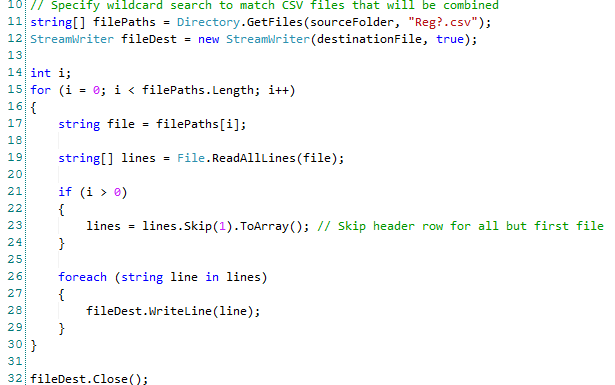 The simple script below shows how to combine csv files without duplicating headings using C#. This technique assumes that all of the files have the same structure, and that all of them contain a header row. The timings in this post came from combining 8 csv files with 13 columns and a combined total of 9.2 million rows. I first tried combining the files with the PowerShell technique described here. It was painfully slow and took an hour and a half! This is likely because it is deserializing and then serializing every bit of data in the files, which adds a lot of unnecessary overhead. C# script combines multiple csv files without duplicating headers. took about 3.5 minutes on a network share and 44 seconds on an SSD. Let me know what you think in the comments. And if you know of a faster way to accomplish this, I’d love to hear it! 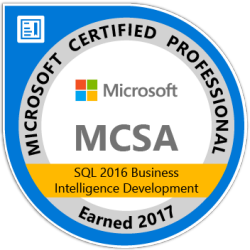 Also included are the helper classes containing the methods to move the data from column to row-based format then to csv format. That sounds very useful, Declan. Thanks for sharing the code!